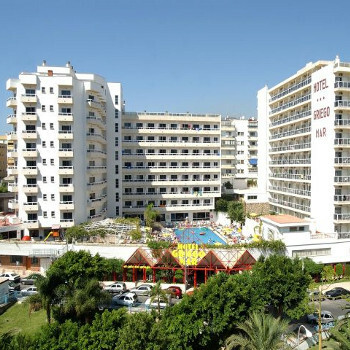 The Griego Mar enjoys a central location close to cafes, nightlife and shops. It is 250 metres to the bus stop for the beach, which is recommended as the route is steep. The central location can mean some noise. We had a fabulous break, the hotel was clean, rooms up to very good standard. We went all inclusive and could not fault the food or drink, despite coming to end of their season, entertainment was excellent. The staff and management were very friendly and helpful. I would particularly want to thank Carl the assistant manager, for making our last day extra special. We definitely return and use any of the Marconfort hotels. Have never stayed all inclusive before and was surprised how good & varied the food was. There were queues to get in the restaurant at times though. The room was clean & the air conditioning was very welcome although a bit noisy. The pool area was small for the size of the hotel & the number of guests, for that reason we used the courtesy bus to the beach most days. The hotel wasn't far from the beach but it is a steep walk back. We didn't have much contact with the staff but those we did speak to were friendly & helpful. The entertainment was pretty awful. Booked a family room that should sleep 5 people but the room we got consisted of a double bed & a sofa bed & once opened up, the sofa bed butted right up to the double bed & that filled the room. Inadequate storage space, inadequate air conditioning & the pillows were made up of a pillowcase filled with chopped up pieces of foam! Very uncomfortable. Not that you'd get any sleep anyway, as if you have a room near a lift, all you'll hear all night is the droning noise of the lift going up & down. The hotel is dominated by rude Spanish guests who clearly do not like the British at all. Stand up from your table & they will just swipe your chair away for themselves without asking. Kids club & entertainment is totally geared up for the Spanish too. Pool area is tiny, & during the school hols, don't expect to be able to swim one stroke without bumping into someone. Sunbeds, (if you're prepared to fight for one when they're released) are packed round the pool like sardines & there is just NOT enough room for the number of guests staying in the hotel. First night in the hotel, there was a brawl on the terrace involving a large number of people which was very frightening. Speaking to other English holidaymakers, fighting in this hotel appeared to be the norm. Another night, we witnessed 2 men arguing & flinging beer in each other’s faces, & over the course of the week, many other incidents. Everyone we spoke to had witnessed fights & violence within the hotel yet nobody who was involved in any trouble was ejected from the hotel. This place is ready to blow at any time, & regularly does! It is not a safe place to stay & I would never ever go back, even if they paid me to go. Much of our time was spent away from the hotel. Brits beware, we're not welcome there. Definitely value for money, we stayed here for 9 nights, 2 adults and one child aged 10. Wasn't expecting much as paid very little for an all inclusive break and was pleasantly surprised by the cleanliness of the hotel and the quality of food. Hotel was a little dated in areas (bedrooms and games rooms) but this mattered very little as most of the time we were outdoors and not sat inside. Bar areas and dining room were very clean and the all inclusive drinks option had a very good choice, there was a different kids cocktail on offer every day. Pool area is very small for the size of the hotel but again it is clean and in reasonable repair. Sometimes there were queues at the bar but these were never very long as staff were very quick, there are several bars to choose from but most people seem to use the one by the pool in the evening/during the day which makes it a little busy. All in all a good hotel, if you want to go somewhere for a very reasonable price that is clean and has reasonably good quality food then this place is ideal. If you expect 5 star then this hotel is not for you. It is 3 star and very good value. I visited this hotel in July 2009. I went on a short break with my mum (all inclusive). We were after a nice relaxing break. My mum and I liked the hotel. We found it to be clean. The hotel room was fine, although not the best view from the balcony this did not especially bother us. The staff were pleasant and helpful. The staff in the restaurant seemed very efficient and hardworking. There was a good mix of nationalities staying at the hotel and a good mix of ages. There was plenty to choose from at meal times, they seemed to cater for lots of different people. It was quite busy at mealtimes, however, this was to be expected as it is a very large hotel. If this is a problem for anybody then it is just a case of avoiding the restaurant peak times. From the hotel it was a 15min walk to the beach. There are lots of steps down to the beach so not good accessibility for older or disabled people and proved tricky for parents with babies. There were, however, other less tricky routes down to the beach. My mum and I enjoyed this route to the beach as there are lots of little shops and stalls to look in on the way down. The beach was nice and although it got busy never seemed overcrowded. There were some nice little restaurants on the beach serving reasonably priced drinks, snacks and meals. There were free public toilets on the beach. My mum and i spent a lot of time on the beach and wandering around the shops. We didn't go around the pool as we preferred to go to the beach. It would probably have been quite busy around the pool due to the sheer number of people at the hotel. We never had to queue too long at any of the bars for drinks. We found the lifts a bit small and claustrophobic but managable. The beds were a bit hard but we were able to sleep on them ok. There was (free) air conditioning in the room which we kept switched off at night as it was a little noisy. I have visited Benalmadena (next door resort) before with my boyfriend. It is a nice resort with a nice marina and some nice restaurants on the beach. It is worth a visit. I've also been to Fuengirola for the day and particularly enjoyed the zoo there. Would definitely recommend visiting it. The train service is very good. It is very cheap to get to Benalmadena and Fuengirola and both are nice to visit. You can get to Mijas and Marbella by bus for a reasonable price. I haven't visited either but have heard that both a worth a visit. Also, it's very cheap and easy to get the train to malaga airport (although there are a few steps to contend with). I would definitely recommend going to this hotel. We booked a low priced last minute short break and got what we expected for the money. Bit worried at first after reading reports however on arriving Hotel appeared ok, nice clean entrance and staff polite and helpfull, we went all inclusive and found the meals ok with a good choice, the problems mainly are around the bar as there is only 1 open during the day and the Hotel is ran on skeleton staff and no one is ever in a rush, so be prepared to wait, the pool is a joke and far to small for the Hotel and the sunbeds well i have never experienced anything like it, we had people lying next to us literally inches away due to the little space,by the way no childrens pool, the main seatting area next to the entertainment area never gets cleaned during the day so there is rubbish all over the place, the entertainment was mainly Spanish focused,apart from the kids mini disco, we have no interest in Spanish dancing every other night, and be warned the place is over run with Spanish, the rooms are excellent and very clean with bedding and towells changed regulary, forget about the lifts as the Spanish kids play with the lifts and no one appears bothered, we would not visit the hotel again, however felt the location was good as it was very central. First impressions not good, scruffy outside with old and smelly reception area, distinct lack of air conditionoing in public areas. Our rooms faced pool luckily because the surrounding buildings/area not pretty at all. One room air con leaked and flooded balcony all day, whilst other room (115)air con had broke and smelt musty and damp. Good point though the showers were brill and clean towels. Upgraded to AI mainly for soft drinks during day as temps over 36. But only pool bar open until evening so queues very long and most of the staff miserable/rude. The food selection and quality was average with some nights better than others, but the diningroom was awful. It was busy within 15 mins of opening, difficult to find clean table and extremly noisy with ignorant staff and no restaurant manager. There was no (or inadequate) air conditioning and the place was heaving, the queues were long with people pushing in constantly. The hotel appeared to be about 80% spanish guests who tended to sit in large groups pulling tables together shouting and adding to the unpleasant atmosphere. Children all ages allowed to serve themselves at buffet, we witnessed many messing with the food with hands, dropping/spilling stuff, no one appeared to bother. Defo needed alcohol gel at entrance! Pool/patio area is too small, I have never done a 'sunbed run' like it. You have to reserve your 'space' with chairs for an hour before they unchain the beds at 9-9.30 then swap them over, beds are far too close together due to lack of space, most unpleasant. The pool was also very busy with no separate kids pool, but did have lifeguard. Entertainment run by hotel not up to much especially the evening, some would start at 11.30pm. Would not visit again and glad only had one week here! Upon arriving to this hotel I was feeling quite nervous as I had read alot of negative reviews about it. I am happy to say that we found the hotel to be of a good standard. We travelled with our 3 daughters and had paid a fab price, so we were going with the thought that if the food was no good then we would go out to eat. But we really enjoyed the food and found that there was a different choice every evening, we never struggled to get a table and it was always clean. Don't get me wrong it was busy!!! The pool area was quite small for the size of the hotel and it could have done with having a childrens pool. It did get busy, but again we never struggled to get sunbeds. The bar area was fab, firstly you had the pool bar, ok, it got busy, but there was always a few bartenders behind it so the queue went down very quickly. Then there was Cafe Griego bar that was open after 6pm, that was never that busy. Then Pepe's bar, that opened after 10.30 and children had to be out by 12am. The selection of drinks was fab, there was everything, but if you wanted branded drinks you could pay half price, which we found very reasonable and the measures were very generous. The entertainment in the evening, we found was great. The kids really enjoyed it. Don't get me wrong if you didn't have kids it really wouldn't interest you. On the whole we really enjoyed this holiday and would definetely recommend it. we went to this hotel despite the reviews on here. we found the hotel to be clean ,food was nice, staff was friendly. location was ok but we went to the beach in a taxi and that was cheap .entertainment was ok for the kids but didnt start until 9.30 pm and i thought this was a bit late.the food for the kids was repetitive but nice.i would go to this hotel again.be warned the sunbeds go early!! !